Amp up your graphics card. 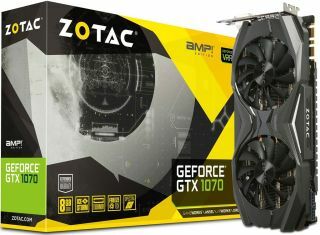 Multiple online vendors have Zotac's GeForce GTX 1070 Amp Edition graphics card listed for sale, though if you're looking for the best deal, Jet.com has the competition beat. The sale price at Jet.com is $385.70, down from $450. You can knock nearly an additional $10 off the price by opting out of free returns and paying by debit card. That brings the price down to $375.73. That beats both Amazon ($385.70) and Newegg ($410). There is an even better price to be had for new customers. If you haven't ordered from Jet.com, create an account and use coupon code TRIPLE15 to strike $30 off the price. This is a 15 percent off coupon code capped at $30 and is good on your first three orders. We've seen this coupon code in the past and right now it expires on April 1, 2017. If you can take advantage of every discount here, your tally will come to $345. That's a really good price on a factory overclocked GeForce GTX 1070 with a custom cooling solution. The caveat here is that Jet.com is not a participant in Nvidia's 'Prepare for Battle' free game promotion in which buyers of a GeForce GTX 1080 or 1070 graphics card (or laptop system) can choose between For Honor or Ghost Recon Wildlands. Finally, the TRIPLE15 coupon code can be used on any order at Jet.com that comes to $35 or higher. If you're not interested in a GeForce GTX 1070, you might find a good deal on a different card.